This year the organisers introduced a new admittance fee structure to the weekend, the effect was that numbers were down on last year, which couldn't be attributed to the weather!! Though the forecast was for 'unsettled' (or rather the forecaster is just hedging their bets) the day was generally glorious. No rain, though the wind was a trifle chilly at times. Due to an illness the Co-Pilot was unable to attend which was a shame, and meant that I had to take the long route to the Museum as I'd not really done much about checking the map in preparation! As TRisha was one of the cars on the TR Drivers Club stand I had to be there before 09:30, not a problem I'd be there for 09:00. Well I was taking the long route and to confound matters the first part of my journey was hampered when I encountered, and was held up by, about 4,891 Citdrone Saxo's or Pugs such as the 205 or 206. 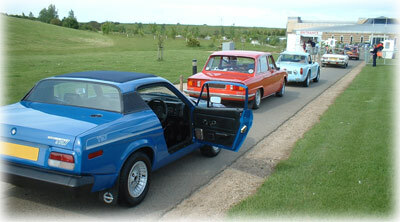 Yes it appears the Barry Boys were out for a 'French Car' day somewhere in Leicestershire, maybe Bruntingthorpe. All this meant that I was travelling at a speed which isn't condusive to retaining your license along the A46 and M40! I made it there by-the-way! It was good to meet and chat to many of those who drop into the forum and put real names to some of those aliases; even if we weren't able to offer a definite solution to the problem afflicting Karl and Donna's yellow FHC. 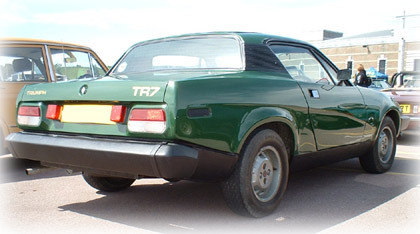 Judging by those passing by the Club stand there does appear to be real interest in the TR7 and the car was probably the dominant car within the Triumph only parking.... and FHC's were well represented for a change! There's a whole ream of photo's in the gallery - chances are if your TR7 was there then I got a photo - and it was as I ambled around (sticking TR Drivers Club cards under your wipers!) that I met a TR2 owner had left that at home and turned up in his TR7 instead - this one quite rare as it was a tin-lid without the sunroof, in very original condition. 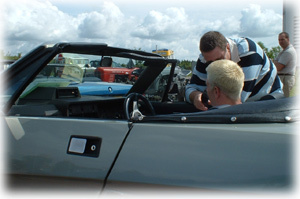 And whilst admiring Karl and Donna's FHC a TR7 DHC driver was lamenting the loss of his FHC - he bought a DHC after having to sell his FHC on medical grounds, due to back problems caused, by getting in and out of the vehicle. So mosey into the gallery for a selection of the vehicles there on Sunday 30 May 2004.